Do you manage a Facebook Page or Group? How about a Forum or a Blog? If you engage with your organisation’s stakeholders in some way online, and you allow two-way conversations to happen, then it is highly advisable for your company or not-for-profit (or charity/association) to develop online community guidelines. This online community guideline should be created in conjunction with your social media policy. Here are some top tips when creating your organisation’s community guidelines. Tip 1: Start with the basics. Include what the community guidelines is for and what it’s all about. Does it cover comments on your blog, Facebook, forum, or all of the above? Give the reasons and timing for moderation. Include an overview of your organisation’s most important values when it comes to community engagement. Tip 2: Add a human element when possible. Do you have a community manager, coordinators, or moderators on board? Make sure you mention their names, whenever possible. Let people know that even though they’re connecting to your brand or organisation, there are real people behind the digital channels. Tip 3: Keep it simple and readable. Unlike policies which may be filled with ‘legalese’ and industry jargon, community guidelines should keep your average community member in mind. Make sure it’s easy to digest, short, and easily scanned. The important thing to keep in mind is that you want your members and participants to read it. Tip 4: Make the guidelines clear. Tip 5: Create and maintain a process for moderation. If you have “three strikes policy” for certain online behaviours (eg, overly sales-orientated posts or offensive language), make that known to your community. What will first time offenders get? How about second time offenders? And, those who have been habitually breaking the house rules? There might also be online behaviours that you have a “zero tolerance policy”. Let people know if this is the case, and why. If you say that you will monitor online community behaviours during certain times, make sure that you do. If you say that you will delete certain comments and offer reasons for doing so, do your best to deliver as such. Tip 7: Make sure that the guidelines are easily available to members and visitors. If you have a set of online community guidelines, make sure that your members and visitors are aware of it. So, make sure you have a link to it easily viewable on your website, forum, blog, or Facebook Page/Group. You might even consider linking to it in your members’ welcome emails, newsletters, or sign-up page. This way, even new members and first time visitors can find and read them. And, some of your community champions might even easily refer to them once they start helping you to moderate. Tip 8: Balance it all out. While it’s important to make sure that you set parameters of engagement for your online community, make sure that you’re not being a tyrant and discouraging people to participate for fear of doing something wrong. Tip 9: Don’t just protect yourself, protect your community too. Your online community guidelines shouldn’t be created just to protect your organization or your cause. Make sure that you create a safe haven for your participants too. If people who leave comments on your blog, forum, or Facebook Pages/Groups don’t feel safe enough to participate, then there is a definite need for you to intervene. Download this Word Document from the VIP Circle Content Library. Tip 10: Refer to other online community guidelines and templates. While creating your own online community guidelines for your not-for-profit or business organisation, you might want to look at sample guidelines for your reference. Telstra’s Community Guidelines is a good example for companies, while The Arc’s Online Community Guidelines is a good example for not-for-profit organisations. There are other many excellent example community guidelines out there, so make sure you have a look and emulate those that fit your organisation’s needs. Bonus: If you’re a VIP Circle Member, you can access our Online Community Guidelines template/questionnaire, which can help you to create your own guidelines for your organisation. Tip 11: Have a crisis plan in place! If things go wrong in your online community, make sure that you have a crisis plan in place so that you’re able to deal with any possible issues that may arise at any given time. 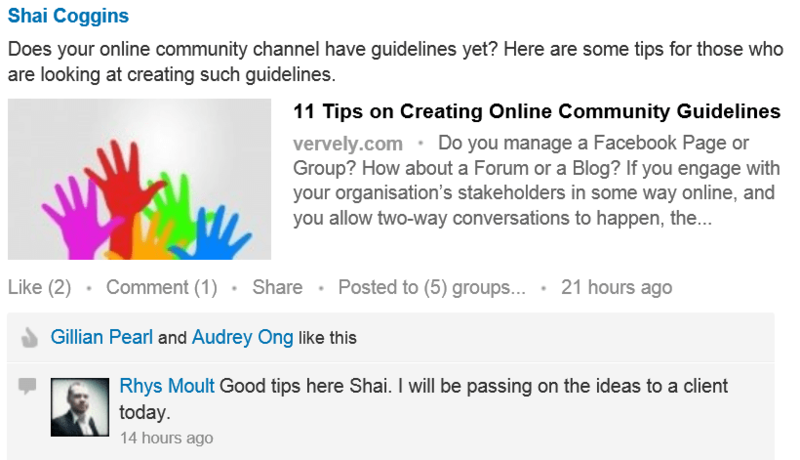 Do you need help in creating your organization’s online community guidelines? Contact Vervely for help! We can provide you with a customised questionnaire for creating your online community guidelines for your blog, forum, or any social media platform. I’m a believer in social media, social and business @shaicoggins @vervelycom and you are tweeting some of the best guidance, world class!